4.1 out of 5 based on 49 bloggers and 8 commenters. 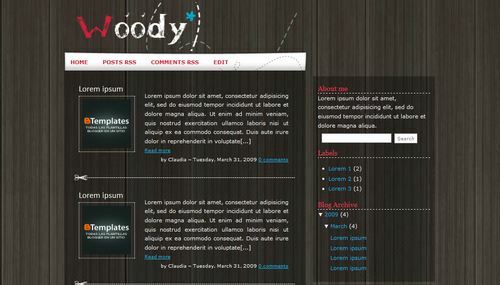 Woody is a free blogger template adapted from WordPress with 2 columns, right sidebar, grunge style and posts thumbnails. Image towards the left of each post is interesting. The background woody effect is nice. If it includes a slider like in my blog it would be better. this template is very good! i like it ! i have used it! But i dont like the way u can’t have ur blog’s name at the top instead of ‘woody’ is there something u can do about that. LOVE IT!! I HAVE THIS TEMPLATE IN MY BLOG!